1Department of Neurosurgery, Beijing Key Laboratory of Epilepsy, Beijing Institute for Brain Disorders, Beijing Sanbo Brain Hospital, Capital Medical University, Beijing 100093, China. 2Department of Brain Institute, Beijing Key Laboratory of Epilepsy, Beijing Institute for Brain Disorders, Beijing Sanbo Brain Hospital, Capital Medical University, Beijing 100093, China. Tianfu Li, M.D., Ph D.
For children with catastrophic epilepsy, vagus nerve stimulation has been demonstrated as a palliative treatment for those with surgical contraindication. The purpose of our study was to assess the efficacy on seizures, to assess the neuropsychological efficacy of vagus nerve stimulation in children. Our study reviewed files of 56 children treated with vagus nerve stimulation between May, 2008 and December, 2013 in our center. Data was collected from baseline to 12, 24 months of follow-up, including seizure frequency, seizure duration, seizure severity and neuropsychological outcomes. In the population of these 56 children, vagus nerve stimulation significantly reduced seizure frequency, duration and severity. The response rates (reduction >50%) were 46.4%, 57.2% at 12 months, 24 months. Furthermore, VNS also significantly achieved improvement of neuropsychological outcomes, particularly the language function of the children under 6 years. The children with catastrophic epilepsy, especially those under 6 years, could benefit from vagus nerve stimulation by reducing seizure burden and improving neuropsychological development. Epilepsy is a neurological disorder characterized by chronic tendency of recurring, unprovoked seizures. The quality of life could be significantly impaired by epileptic seizures, especially for children under 14 years . The children with epilepsy, whose seizures onset was early and frequency was so high that their development was stagnated, are usually defined as “catastrophic childhood epilepsy” . A couple of previous studies showed that the prognosis of children with catastrophic epilepsy depends on the etiology and the early control of the seizures [3-5]. Surgical treatment has been regarded as most effective way to control the seizures of children with catastrophic epilepsy . Unfortunately, the children with catastrophic epilepsy and surgical contraindication, are defined as treatmentresistant . Under those circumstances, vagus nerve stimulation (VNS) is an optimal approach to achieve the control of seizures of children with treatment-resistant catastrophic epilepsy . Moreover, an increasing body of literature confirmed the efficacy of seizure reduction by VNS in pediatric patients with refractory epilepsy [9,10]. In addition to the effect on seizure reduction, the efficacy of VNS on neuropsychiatric outcomes, including improvement of quality of life, behavior, cognition, was still a controversial issue [11-13]. Our purpose was to access the efficacy on seizure reduction, to evaluate the efficacy on neuropsychological outcomes by using Denver Developmental Screening Test (DDST) and Wechsler Intelligence Scale for Children- Chinese (WISC-C). In this single-center, retrospective study, we reviewed data for all children (1~14 years) implanted with vagus nerve stimulator. The objectives of this study were not only to access efficacy on seizure, but also to evaluate efficacy on neuropsychological outcome in children. Every child has detailed medical data, including age, gender, age at onset, age at VNS, seizure type, antiepileptic drugs, magnetic resonance imaging, electroencephalograph and neuropsychological outcomes. Seizure frequency, duration and severity were recorded at baseline (before VNS), 12 months and 24 months. The efficacy on seizure frequency was divided into seizure free, reduction ≥75%, reduction <70% to ≥50%, reduction <50% and exacerbation. The efficacy on seizure duration or severity was divided into no alterations, reduction ≥50%, reduction <50%. For children under 6, years, Denver Developmental Screening Test (DDST) was used to assess social and personal skills, gross motor functions, fine motor function, and language function. For children between 6 and 14 years, full scale intelligence quotient, verbal comprehension, perceptual reasoning, working memory, processing speed was assessed by Wechsler Intelligence Scale for Children- Chinese (WISC-C). Statistical analysis was performed using SPSS statistical software version 19.0 for Windows (SPSS Inc., Chicago, IL, USA). Nonparametric data were assessed using the Wilcoxon test. The significance of P value was divided into <0.05, <0.01, <0.001. VNS devices were implanted in 56 children (42 boys and 14 girls) between May, 2008 and December, 2013 in our center (Table 1). All children treated with VNS were diagnosed with refractory epilepsy but not amenable to surgery. According to the classification of the International League against Epilepsy (ILAE), 56 children were diagnosed with refractory epilepsy (4 cases of malformations of cortical development, 9 cases of infection, 2 cases of trauma, 16 cases of hypoxic ischemic encephalopathy, 11 cases of West syndrome, and 14 cases of Lennox Gastaut syndrome). Table 1: Demographic data of children treated with vagus nerve stimulation, N=56. The mean age of onset was 3.54 years(standard deviation 3.47 years), and the epilepsy duration ranged between 11 months and 10 years with a mean of 4.84 years (standard deviation 2.77 years). The average seizure frequency at baseline was as follows: <10 seizures /month in 4 patients (7.1%), 10-100 seizures /month in 24 patients (42.9%), and >100 seizures/month in 28 patients (50.0%). All diagnosis and follow-up were ensured by pediatric neurologists in our epilepsy center. At 12 months follow-up, 46.4% of the children achieved response on seizure frequency (reduction >50%), including 5.4% were seizure-free (Figure 1). In addition, 26.4% of the children achieved reduction ≥50% of seizure duration, 32.1% of them achieved reduction ≥50% of seizure severity (Figure 1). 57.2% of the children were responders who achieved >50% reduction from baseline to 24 months following up, while the percentage of seizure-free was still 5.4% (Figure 1). In aspect of seizure duration and severity, the percentage of responders was up to 35.2% and 37%, respectively. Figure 1: Efficacy of VNS on seizure frequency, duration and severity. 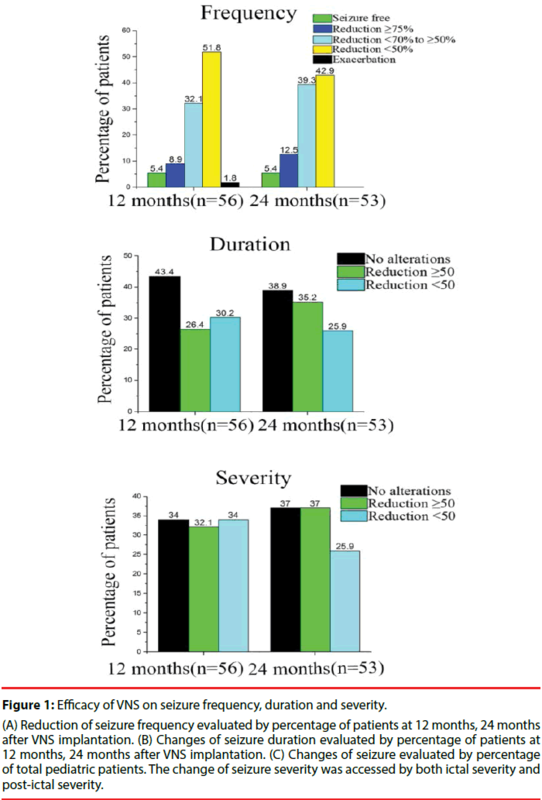 (A) Reduction of seizure frequency evaluated by percentage of patients at 12 months, 24 months after VNS implantation. (B) Changes of seizure duration evaluated by percentage of patients at 12 months, 24 months after VNS implantation. (C) Changes of seizure evaluated by percentage of total pediatric patients. The change of seizure severity was accessed by both ictal severity and post-ictal severity. All children under 6 years, except 3 children refused to receive follow up at 24 months, were accessed using DDST by pediatric neurologist at baseline, 12 months and 24 months, on the other hand, the children between 6 and 14 years were accessed using WISC-C at baseline, 12 months and 24 months. All the children presented neuropsychological improvement, especially those under 6 years. Among the children under 6 years, the gross motor functions and fine motor function were enhanced by 37.3%, 35.9% of baseline at 12 months. At 12 months, the personal-social function presented a 47.9% increase of baseline. In particular, the language function was improved obviously, which presented a 52.8% increase of baseline at 12 months (Figure 2). At 24 months following up, the gross motor functions and fine motor function enhanced by 104.8%, 90.8% of baseline. 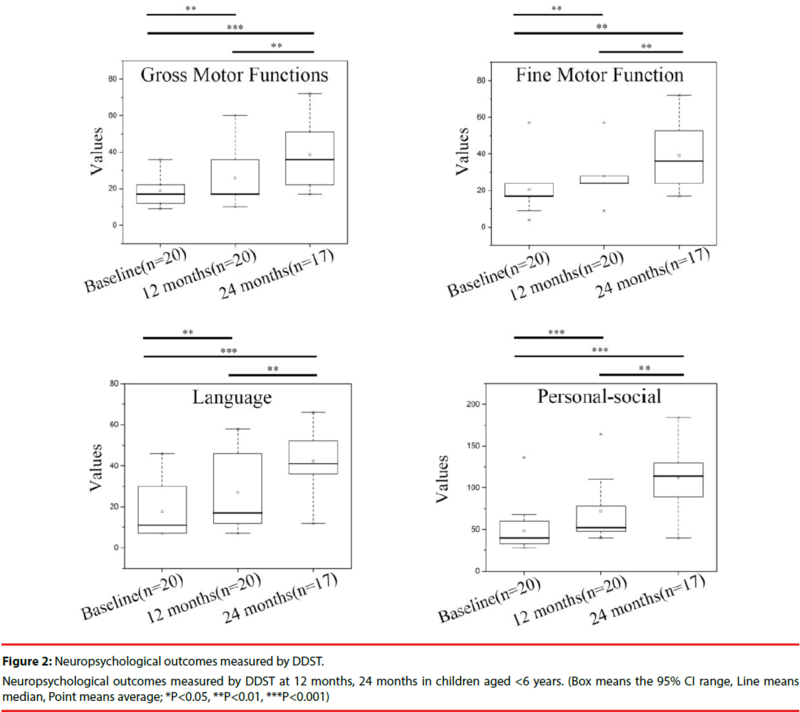 In addition, the personal-social function presented a 129.5% increase of baseline at 24 months, and 140.6% increase of language function of baseline was achieved at 24 months (Figure 2). Figure 2: Neuropsychological outcomes measured by DDST. Among the children between 6 and 14 years, the neuropsychological improvement they presented was slight but significant. The full scale intelligence quotient presented 9.5%, 16.8% increase of baseline at 12, 24 months. The perceptual reasoning, working memory and processing speed were enhanced by 5.4%, 9.4% and 13.4% of baseline at 12 months, and 9.5%, 12.0% and 18.7% of baseline at 24 months. Unlike the children under 6 years, the children between 6 and 14 years presented merely 4.9%, 13.4% increase of verbal comprehension of baseline at 12 months, 24 months (Figure 3). 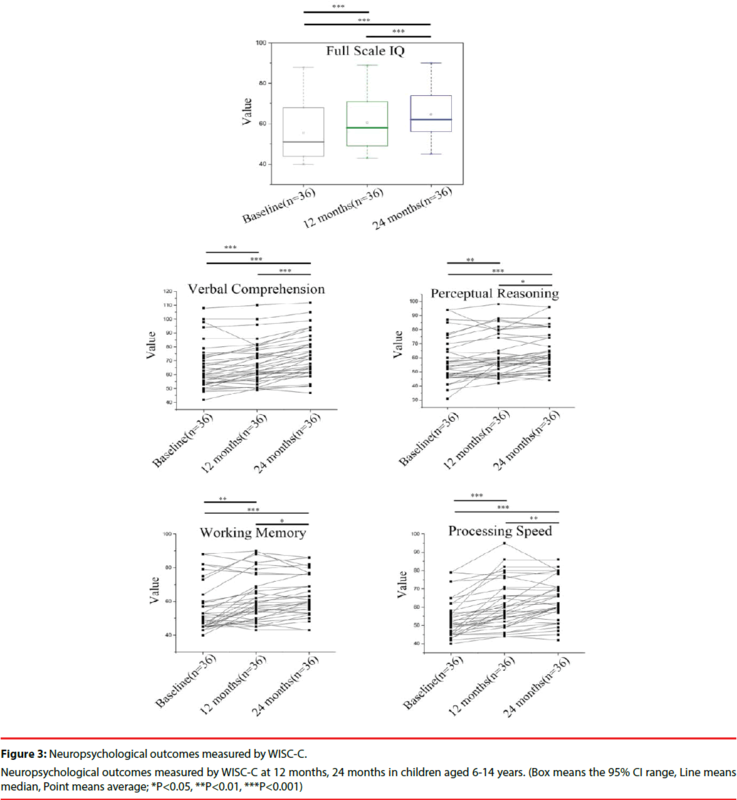 Figure 3: Neuropsychological outcomes measured by WISC-C. Previous studies have demonstrated VNS as an effective treatment for pediatric patients with refractory epilepsy [11,14]. We focused on the children who fulfill the criteria described below: i) younger than 14 years; ii) seizure frequency>10 per month; iii) lack the effectiveness of more than 2 antiepileptic drugs. Our study confirmed the efficacy of seizure frequency, duration and severity within the children treated with VNS implantation. It is of importance, we also confirmed the improvement of neuropsychological outcomes of VNS in the analysis population. The previous data have demonstrated that the psychomotor development of children could be greatly impaired by frequent seizures. In the distinct of pathophysiology, cortical-subcorticalcortical loops contributed to widespread functional disturbance , and abnormal sleep, which was disrupted by nocturnal seizures, could retard normal cortical processing . For children older than 6 years, the development of cortical neurons could be decelerated but synaptic plasticity was still maintained, suggesting deterioration of synaptic plasticity caused learning difficult by producing imbalances between excitation and inhibition . American pioneers firstly introduced the concept of catastrophic childhood epilepsy which was not recommended by the ILAE . Most of previous studies defined the criteria of onset age of catastrophic childhood epilepsy as younger than 6 years [3,6,18]. However, according to our study, it was also significant to achieve the control of children aged 6-14 years with frequent seizures. We observed a progressive increase of response rate in seizure characters (frequency, duration and severity) and neuropsychological outcomes during first 2 years. Our findings were consistent with most of previous studies [19,20]. The efficacy could be increased in many years after VNS implantation . In our study, we found that the neuropsychological improvement of children aged <6 years was much stronger than those aged 6-14 years (Figures 2 and 3). Within children aged <6 years, DDST outcomes revealed great increase of the language function at 24 months following up. Between 12 months and 24 months following up, the personal-social function presented obvious increase from 47.9% to 129.5%, which highly indicated that reduction of seizure burden could be beneficial for the children to integrate themselves into society. Most of studies of VNS were designed as retrospective ones [11,14,19,20,22], including our study. Therefore, it was impossible to separate natural history from the efficacy of VNS implantation . By using DDST and WISC-C, which have been considered as effective tests to screen neurological development in children [24,25], we elucidated the neuropsychological improvement of the children treated with VNS implantation. However, the improvement cannot be totally excluded the effect of natural brain development in pediatric population. It is notable concern that we found the neuropsychological improvements of the children treated with VNS, including the children aged less than 6 years and those aged 6-14 years. These findings further emphasize the need of early VNS implantation in children with refractory epilepsy, especially in catastrophic childhood epilepsy. This study was funded by National Key Technology R&D Program of China (2012BAI03B02), national natural science foundation of China (81571275), BIBDPXM2013_014226_07_000084, Scientific Research Common Program of Beijing Commission of Education (KM201410025027), Capital Characteristic Clinical Application Research (Z131107002213169), the capital health research and development of speciaL (2016-4-8011). Guan J, Karsy M, Ducis K, et al. Surgical strategies for pediatric epilepsy. Transl. Pediatr 5(2), 55-66 (2016). Shields WD. Catastrophic epilepsy in childhood. Epilepsia 41(2), S2-S6 (2000). Glauser TA. Following catastrophic epilepsy patients from childhood to adulthood. Epilepsia 45(5), 23-26 (2004). Wyllie E. Surgery for catastrophic localization-related epilepsy in infants. Epilepsia 37(1), S22-S25 (1996). Krishna V, Sammartino F, King NK, et al. Neuromodulation for Epilepsy. Neurosurg. Clin. N Am 27(1), 123-131 (2016). Otsuki T, Kim HD, Luan G, et al. Surgical versus medical treatment for children with epileptic encephalopathy in infancy and early childhood: Results of an international multicenter cohort study in Far-East Asia (the FACE study). Brain. Dev 38(5), 449-460 (2016). Berg AT, Zelko FA, Levy SR, et al. Age at onset of epilepsy, pharmacoresistance, and cognitive outcomes: a prospective cohort study. Neurology 79(13), 1384-1391 (2012). Douglass LM, Salpekar J. Surgical options for patients with Lennox-Gastaut syndrome. Epilepsia 55(4), 21-28 (2014). Blount JP, Tubbs RS, Kankirawatana P, et al. Vagus nerve stimulation in children less than 5 years old. Childs. Nerv. Syst 22(9), 1167-1169 (2006). Fernandez L, Gedela S, Tamber M, et al. Vagus nerve stimulation in children less than 3 years with medically intractable epilepsy. Epilepsy. Res 112(1), 37-42 (2015). Tsai JD, Chang YC, Lin LC, et al. The neuropsychological outcome of pediatric patients with refractory epilepsy treated with VNS-A 24-month follow-up in Taiwan. Epilepsy. Behav 56(), 95-98 (2016). Ulate-Campos A, Cean-Cabrera L, Petanas-Argemi J, et al. Vagus nerve stimulator implantation for epilepsy in a paediatric hospital: outcomes and effect on quality of life. Neurologia 30(8), 465-471 (2015). Klinkenberg S, van den Bosch CN, Majoie HJ, et al. Behavioural and cognitive effects during vagus nerve stimulation in children with intractable epilepsy - a randomized controlled trial. Eur. J. Paediatr. Neurol 17(1), 82-90 (2013). Orosz I, McCormick D, Zamponi N, et al. Vagus nerve stimulation for drug-resistant epilepsy: a European long-term study up to 24 months in 347 children. Epilepsia 55(10), 1576-1584 (2014). Frost JD Jr., Lee CL, Le JT, et al. Interictal high frequency oscillations in an animal model of infantile spasms. Neurobiol. Dis 46(2), 377-388 (2012). Tassinari CA, Rubboli G. Cognition and paroxysmal EEG activities: from a single spike to electrical status epilepticus during sleep. Epilepsia 47(2), 40-43 (2006). Brooks-Kayal A. Molecular mechanisms of cognitive and behavioral comorbidities of epilepsy in children. Epilepsia 52(1), 13-20 (2011). Oguni H, Otsuki T, Kobayashi K, et al. Clinical analysis of catastrophic epilepsy in infancy and early childhood: results of the Far-East Asia Catastrophic Epilepsy (FACE) study group. Brain. Dev 35(8), 786-792 (2013). Bodin E, Le Moing AG, Bourel-Ponchel E, et al. Vagus nerve stimulation in the treatment of drug-resistant epilepsy in 29 children. Eur. J. Paediatr. Neurol 20(3), 346-351 (2016). Elliott RE, Morsi A, Kalhorn SP, et al. Vagus nerve stimulation in 436 consecutive patients with treatment-resistant epilepsy: long-term outcomes and predictors of response. Epilepsy. Behav 20(1), 57-63 (2011). Morris GL 3rd, Gloss D, Buchhalter J, et al. Evidence-based guideline update: vagus nerve stimulation for the treatment of epilepsy: report of the guideline development subcommittee of the american academy of neurology. Epilepsy. Curr 13(6), 297-303 (2013). Kahlow H, Olivecrona M. Complications of vagal nerve stimulation for drug-resistant epilepsy: a single center longitudinal study of 143 patients. Seizure 22(10), 827-833 (2013). Dugan P, Devinsky O. Epilepsy: Guidelines on vagus nerve stimulation for epilepsy. Nat. Rev. Neurol 9(11), 611-612 (2013). Hommet C, Billard C, Gillet P, et al. Neuropsychologic and adaptive functioning in adolescents and young adults shunted for congenital hydrocephalus. J. Child. Neurol 14(3), 144-150 (1999). Meisels SJ. Can developmental screening tests identify children who are developmentally at risk? Pediatrics 83(4), 578-585 (1989).